It’s official. Our improved website is now online. Great prices, easier to navigate, guest checkout, and more purple martin items than ever before are just some of the benefits of our new improved site. 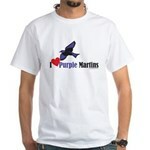 PurpleMartinPlace.com is OPEN! We have been working on this new site since 2012 and it has been open and doing business for over a year but we are now comfortable letting PurpleMartins-R-Us take a little break. This entry was posted on Monday, January 25th, 2016 at 8:31 pm	and is filed under Purple martins. You can follow any responses to this entry through the RSS 2.0 feed. Both comments and pings are currently closed.